A couple of links today I'm pretty positive you'll enjoy. First off, thanks to NotCot for alerting the blogosphere to the front and back covers of this year's Neiman Marcus Christmas Book. This department store always delivers the finest style, so it's no surprise they're right on target by spotlighting the phenomenal quilling of expert Yulia Brodskaya (previously featured). 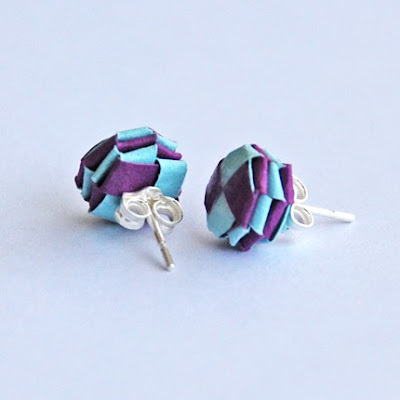 And then, over at The Beading Gem's Journal, sign up to enter the giveaway of nifty folded paper earrings made by Papermode (also featured here). While you're visiting, be sure to click on the links about the number of times a piece of paper can be folded in half. Can't say it's something I'd ever considered until this morning, but obviously many other people have put a great deal of thought into it! I thought of you the minute I saw this cover! I love the modern touch that Yulia gives to her quilling/paper art pieces!